Hmm- I save and save and save my scraps too. And every once in a long while I give them away, to other people who perhaps may use them in a project? ;) I'm just saying- if you need more, I've got them! Well I wouldn't call myself a seamstress by any stretch but I do save scraps of things. 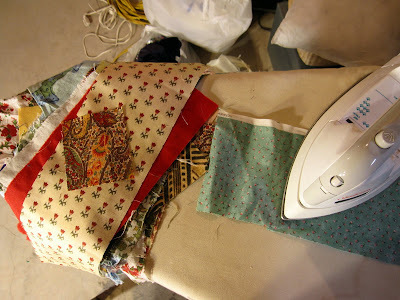 I currently have a set of old sheets that tore and I want to use the least distressed parts for part of a quilt. 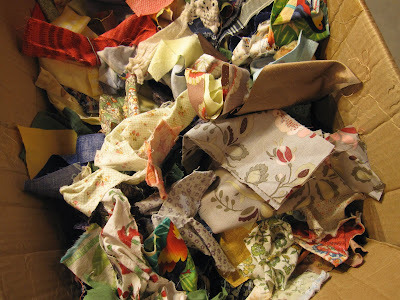 So I guess I keep all my scraps for future quilts. I used to patch my kids pants with 'em. Daughter especially liked crazy colors peeking out of the holes in her jeans all the way through her college years. Not I am trying my hand at String type quilting. But just on little things like a kitchen towel trim or a hot pad. You should join us at the De-Stash Along 2010!